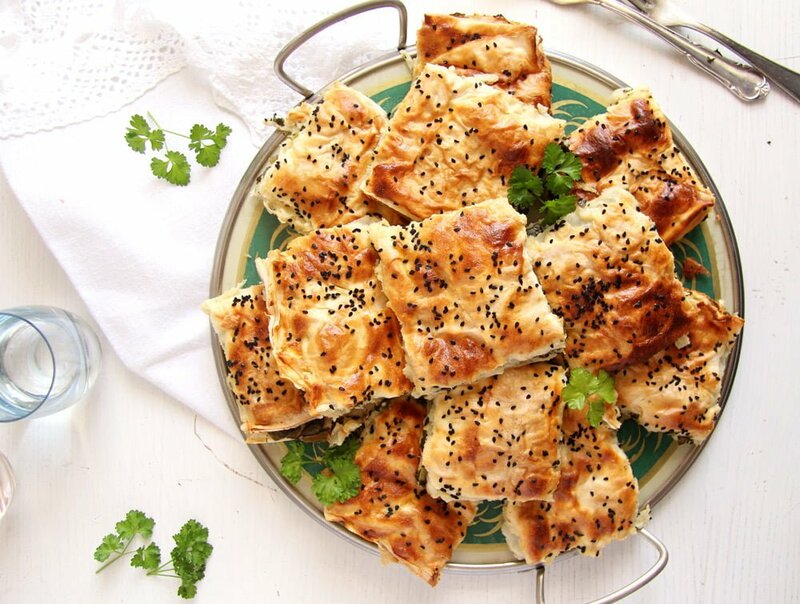 Phyllo pastry filled with spinach, feta and Parmesan, a tender Turkish Börek which can be eaten either hot or cold. I had actually planned to make a typical Romanian spinach pie with homemade pastry and lots of feta. 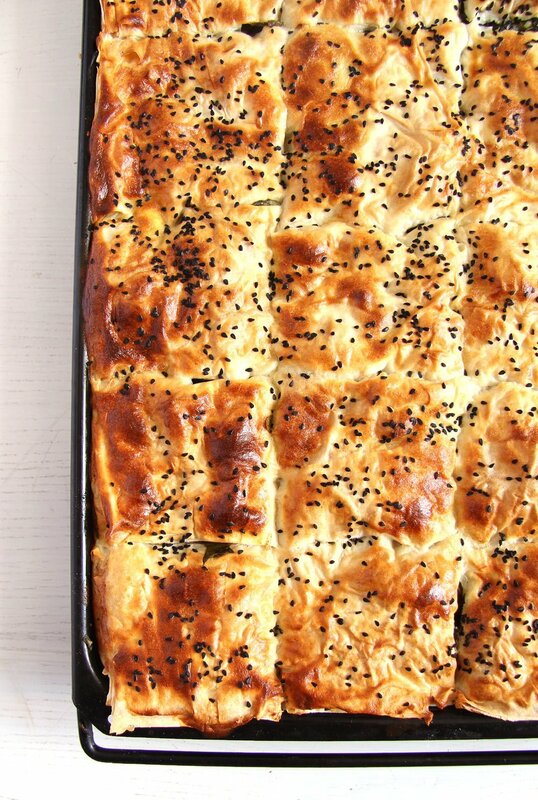 And then I saw these mouth-watering pictures of a börek on Give Recipe and I knew I had to make that instead. It was a great fit finding the recipe at that moment, I still had one pack of phyllo pastry in the fridge, which was supposed to become a wild garlic ground beef pie. So I gave up all the good made plans and started fresh. 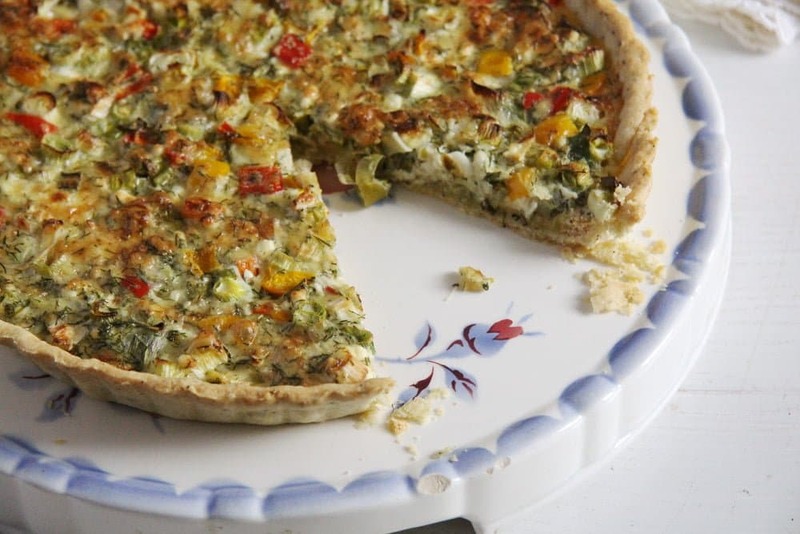 The wild garlic and ground beef became a delicious stir-fry with lots of soy sauce and chilies, the Romanian spinach pie was forgotten and the phyllo pastry got turned into this delicious Spinach Feta Pie or Spinach Börek. 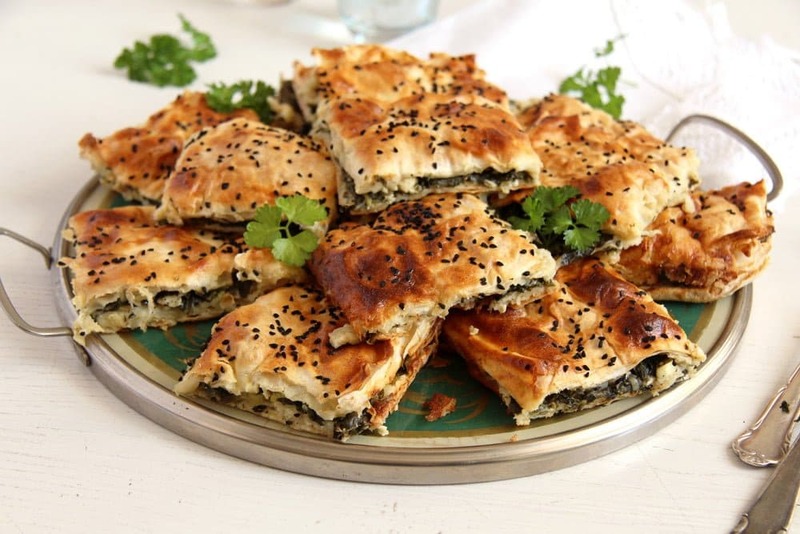 Börek is the original Turkish name of this Spinach Feta Pie. Yes! Turkish not Romanian but I am telling myself that Romania was under the Ottoman rule for hundreds of years and we still have a small Turkish community living in the South East of the country at the Black Sea. And the original Romanian spinach pie I had intended to make was not that different from this Turkish Börek either. I would not have used phyllo pastry, but would have made my own shortcrust-like pastry. Otherwise the filling was pretty similar. For the Romanian version I would have used more feta, smetana instead of yogurt and no Parmesan or nigella seeds. I don’t know if you are familiar with börek, if you are you know how delicious it is and homemade is even better then the usual and if you are not, you should definitely give it a try. I had my share of Turkish börek at the numerous Turkish takeaways here in Germany, sometimes filled with spinach and cheese, sometimes with meat. I like them a lot, but now that I have made my own börek I definitely prefer this homemade version. It tastes more delicate and I love the fact that is not oozing in oil. It is not crispy like the fried original, but tender and comforting. We all loved it, kids included. 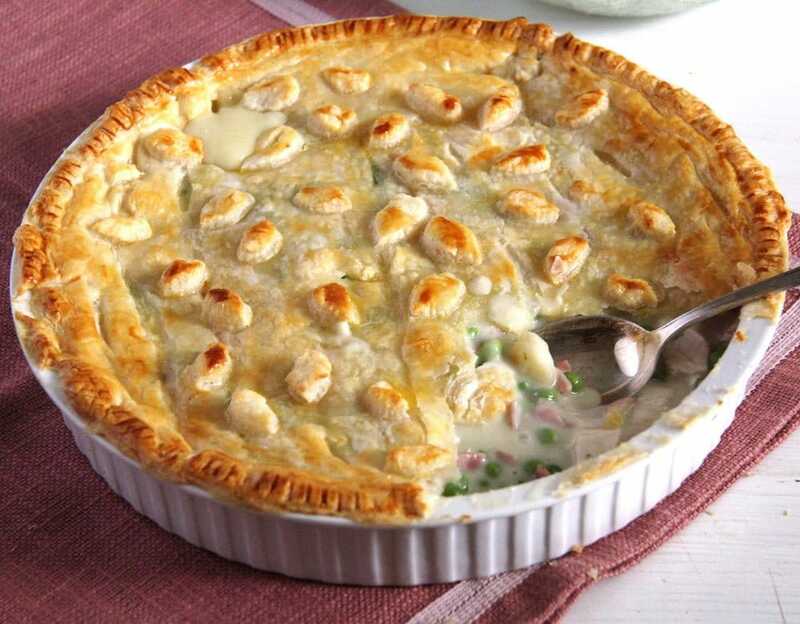 And considering that it is a pie, which under circumstances can be tricky to make, this recipe is very easily put together. Phyllo pastry is quite easily available and uncomplicated to work with and making the filling is so unchallenging is almost not worth mentioning. Chop the spinach and the onions and mix all ingredients together – that’s it! I don’t know if you are all familiar with phyllo pastry, but I find it a great item to have in the kitchen. Especially when unexpected guests are arriving or some evening when you feel like eating something a bit more special without ordering something or overstreching yourself too much in the kitchen. In this kind of situation I remember my pack of phyllo, take it out of the fridge and fill it with whatever happens to be available without going shopping. Until now I have filled them with ground meat (turkey), potatoes, ham and cheese, different vegetables or spinach as well, like in the case of these Albanian Spinach Rolls. Chop the green onions into fine rings and grate the garlic, remove the spinach stalks if too large (I don't usually do it when using baby spinach) and chop it roughly. Place them in large bowl, crumble the feta and grate the Parmesan on top, add the parsley and dill and some salt and pepper. Set aside. Beat the eggs in another bowl. Add the yogurt and the olive oil and stir well. Set aside. Brush a baking tray (35x40 cm/ 14x16 inch) with olive oil. Add the first phyllo sheet so that the sides of the sheet are overhanging. Brush the part of the sheet covering the baking tray with some of the egg yogurt mixture. Carefully tear the overhanging phyllo parts and place them over the brushed sheet of phyllo. Brush with the mixture as well. Repeat with the second phyllo sheet. After brushing it, add all of the filling mixture and level well. Place the third phyllo sheet on top, brush and cover with the overhanging phyllo parts. Repeat with the last phyllo sheet. Brush with the remaining egg yogurt mixture. Cut the pie into squares now. Sprinkle the nigella seeds on top. Bake for about 40 minutes or until golden. Cover with a towel and let cool. We ate it both hot and cold, either way it was delicious. These are one of my favourites! Well, who could resist filo pastry!!! Now I am getting hungry :-! This is a dish that I would truly love. You made it beautifully. It would look lovely on any brunch table. Thank you for sharing. cheese IS good! i’ve never had the authentic version of this dish, only sad imitations. 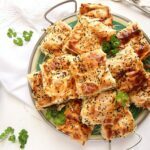 your borek looks amazing! 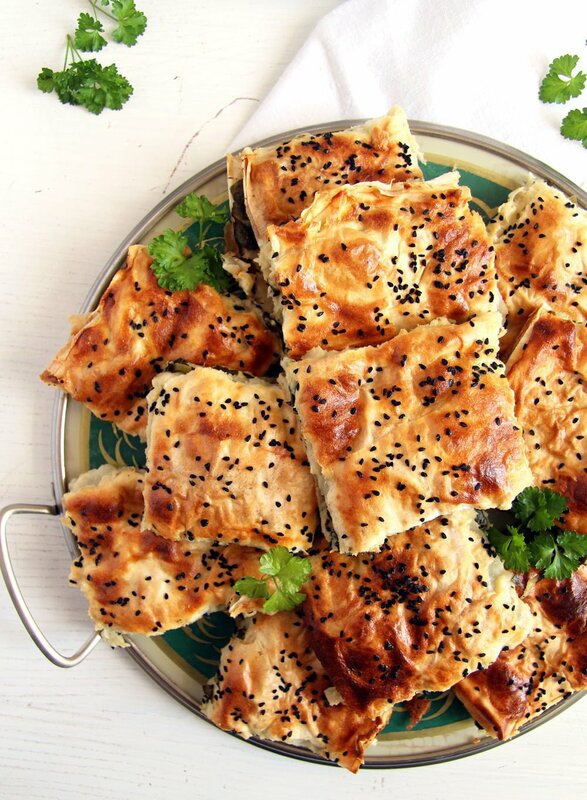 Your borek looks amazing Adina! 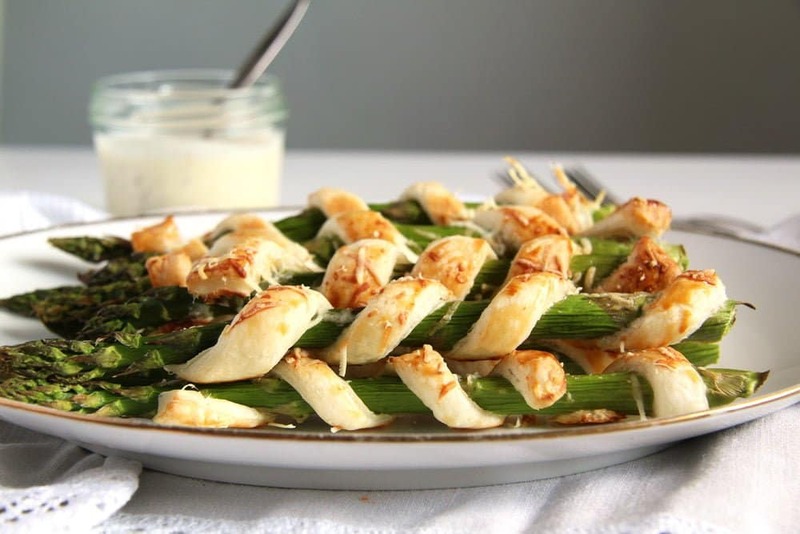 I’m so happy to see this recipe on your blog and thank you for the mention! The layers and the filling between layers look so tempting. I love how you present them. These are making me so hungry! Cheers my friend! Thank you for reminding me young delicious spinach is in season now (with wild garlic and asparagus I’ve completely forgotten the rest of seasonal produce!). Your börek looks fantastic. Reminds me of the Greet spanakopita I often prepare and love so much… I also sprinkle nigella seeds on everything I can (when I don’t do this with sesame seeds 😉 ), so I’m glad we share the love for them! I made this borek last night, exactly as written. It was delicious!